The next-generation bulk carrier Haaga has today been delivered to ESL Shipping from Jinling Shipyard in Nanjing, China. ESL Shipping is part of the Aspo Group. The 160-meter, 25,600 dwt, LNG-fueled vessel generates less than 50% of the carbon dioxide emissions of the previous generation of vessels. The vessel can also be fueled by completely carbon-free biogas, once the availability of carbon-free biogas improves over time. The vessel incorporates several innovative solutions to reduce its environmental footprint by minimizing its energy consumption and emissions. The shipping company and MacGregor, which is part of Cargotec, have developed the world's first autonomous cargo handling solution for the vessel to further improve safety and efficiency. The vessel will have raw material cargo while arriving from Japan to the Baltic Sea, where the vessel is currently scheduled to arrive in mid-September. 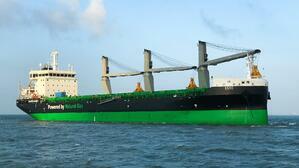 "Our new vessels have met with an excellent reception among our customers. Every employee of our shipping company should be genuinely proud of what we have achieved during our newbuilding project", says Mikki Koskinen, Managing Director of ESL Shipping. The completion of the new vessels will have a positive effect on the shipping company's profitability and competitiveness. "This investment of around EUR 60 million is significant for a company of Aspo's size. It's also an excellent example of our responsible ownership, as environmental responsibility involves considering future generations, too. The design and construction of the new vessels were completed as planned. The vessels will considerably increase ESL Shipping's capacity, in addition to improving its profitability", says Aki Ojanen, CEO of Aspo Plc and Chairman of the Board of Directors of ESL Shipping. This newbuilding project is part of the Bothnia Bulk project, partly funded by the EU. Its goal is to modernize the sea route between Luleå, Oxelösund and Raahe to be more eco-friendly. In addition, environmental emissions will decrease at port with the improved availability of shore-side electricity. The vessels have been designed by Deltamarin in Finland, and European equipment suppliers have provided roughly 60 percent of all vessel systems. 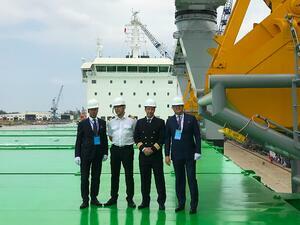 Read more about the new vessels on our special site. From left: Managing Director Mikki Koskinen, Chief Engineer Jarmo Kuronen, Master Jussi Vaahtikari and Chairman of the Board Aki Ojanen during the delivery ceremony. Haaga at sea. 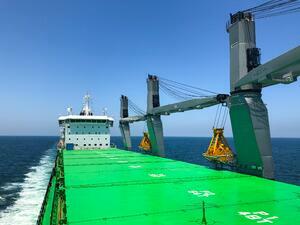 Photo: Jussi Vaahtikari / ESL Shipping Ltd.